Ever since the first time we visited California, back in 2009, I've been fascinated by burritos, in particular, the meal sized burritos most commonly found in California. While there are a few places over here that sell Mexican food, and burritos in particular, most of them fall short in one way or another of the burritos we've eaten in California. Usually it's the size that lets these Australian burritos down, and I've yet to find anyone here that make a burrito that is big enough to be a meal in itself (as the burrito is usually eaten in the USA and Mexico). This was an attempt to create a Mission style 'meal in a burrito' burrito. 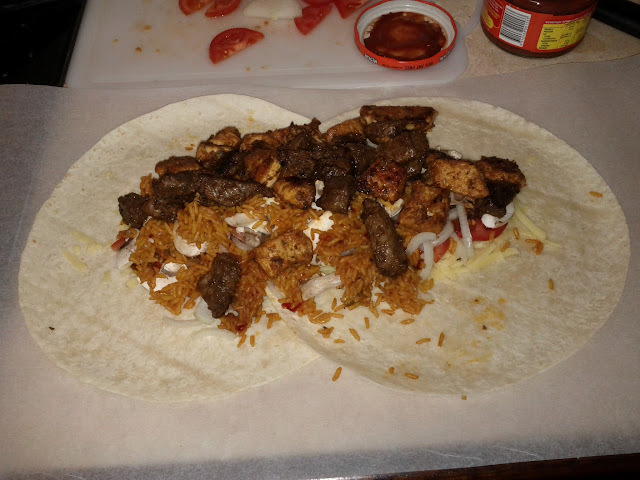 The ingredients were all off the shelf items, including the largest tortilla commonly found in Australia, beef, chicken, shredded cheese, mushrooms, onions, tomato and salsa. In addition, a pack of Uncle Ben's Mexican Rice (microwaveable) a sachet of Old El Paso Chicken Burrito seasoning were vital to the finished product. I used half the seasoning for the chicken and half for the beef, which was all cut into small pieces before seasoning and then left to stand for about 5 minutes. Ideally I would leave the meat in the seasoning longer, but the decision to make burritos for dinner came pretty late in the day. The tortilla's were prepared for use by placing them on a small rack on top of an oven tray, which was partially filled with water, inside the oven at around 180 degrees Celsius. This worked well, but needs a little refinement to ensure even steaming of the tortillas, which makes them much easier to handle when wrapping a large burrito. 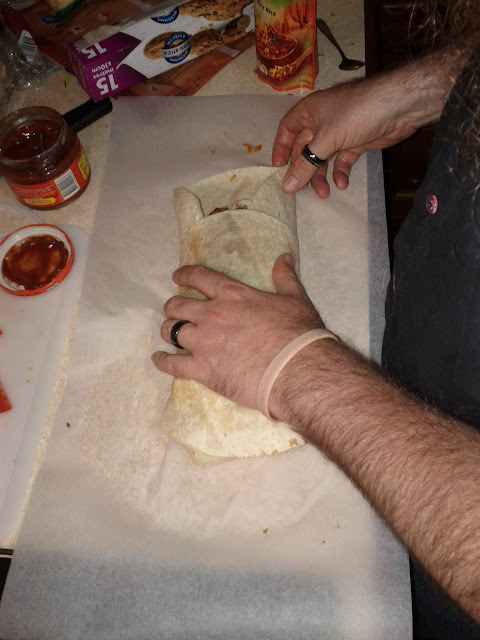 While initially I had thought I could get away with only using 2 tortillas, it became apparent while wrapping the burrito that I would need a third to go around the centre of the burrito. Looking forward to the next attempt, I think I'll use the same 2 tortilla layout to start with, but keep the filling strictly to the length of a single tortilla in the centre of the first 2 tortillas, and then use a third to wrap the centre section, which should in turn give me a little more material to work with at each end.